I finally decided it was time to upgrade my 4.5 year old third generation iPod since Apple refreshed the lines last week. 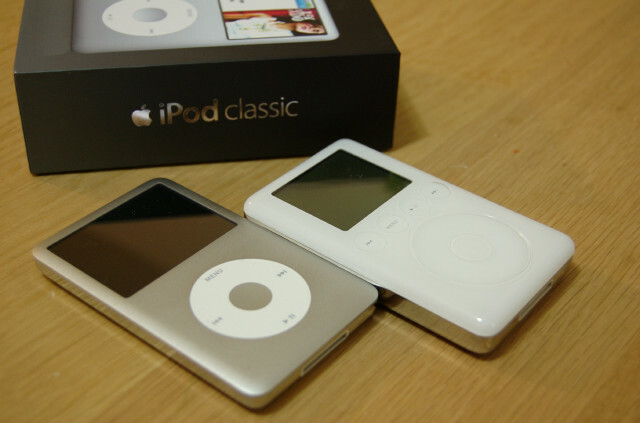 I plumped for the 80GB version of the new ‘iPod Classic’. Yes, it is weird having a new product so much better than the one I have, but be called a ‘classic’. I suppose this means it’ll disappear after this. Anyway, here’s a comparison with my old one – it’s a similar footprint, bigger colour screen and it’s much thinner. I put some pics on flickr! too [now removed]. I’ll add a mini review to Brightblack after a couple of weeks with it. So far, it’s great.